hairulovchessmaniac: Fairin Zakaria Safe From Bukit Antarabangsa Lands Lide Tradegy! Fairin Zakaria Safe From Bukit Antarabangsa Lands Lide Tradegy! 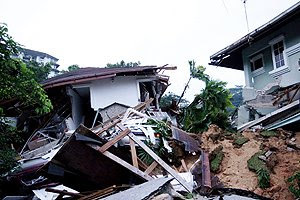 I received a sms last night from Mohd Saprin Sabri which mentioned that former national player - Mohd Fairin Zakaria was one of the Bukit Antarabangsa resident who is safe from yesterday land slide tradegy . Fairin (photo left) mentioned to Saprin that he managed to escaped from Bukit Antarabangsa tru the jungle with the helps from the Army, RELA and JPA3. He's now stayed at Hotel Putra (PUSRAWI) near Institut Jantung Negara (IJN), Kuala Lumpur.